Open year-round for breakfast & lunch, serving incredible desserts and refreshments. Great sandwiches & salads & soups made with local seasonal ingredients wherever possible, and fresh home-baked bread. Croissants, scones and muffins in the morning, and a wide range of incredible layer cakes, cupcakes, cookies and more. Espressos, cappuccinos, lattes, real hot chocolate, more than 20 teas from Harney & sons & Stash, flavored coffees and Italian sodas, plus real fruit smoothies and unsweetened Iced Tea brewed all day. For the past 5 years Black Cat has delivered delectable boxed picnic lunches & dinners to patrons of the nearby Glimmerglass Festival. Open 7 days a week from 8-3:30 from July thru September. Closed Wednesdays in the Fall, and Tuesdays & Wednesdays in Winter. Check Black Cat out on Facebook — we have more than 4000 fans! We’ve been featured on the main pages of CNN, AOL, Fox News Radio and many more, including numerous articles in regional papers and magazines as well as TV and radio (NPR). Black Cat also has a fabulous website and shop. Find the Chamber on Facebook! 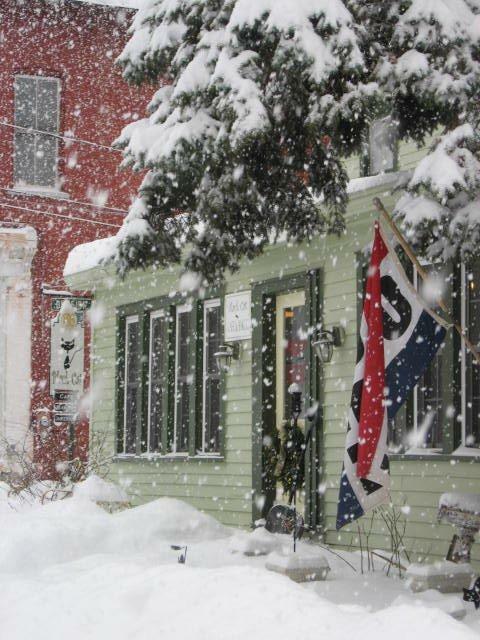 Founded in 1930, the Sharon Springs Chamber of Commerce is a non-profit organization whose mission is to promote business, civic and economic growth in Sharon Springs, NY. Sharon Springs is located at the edge of the Catskill Mountains, overlooking the beautiful Mohawk Valley and is one of New York's richest historical gems. Sharon Springs can be explored while browsing its interesting shops or visiting the Sharon Historical Museum and Schoolhouse. If more active pursuits are what you desire, discover the area's landscape and vistas by hiking or bicycling. You may also partake in the village's self guided historic and architectural walking tours. Our next meeting is the 4th Tuesday of the month at 7:00 pm at The Roseboro. Open to the public. Anyone having interest in the future growth and development of Sharon Springs is invited to attend. Refreshments will be served.